This is the labradorite cab necklace I made. It’s a tubular herringbone chain, and peyote bezel and bail and toggle clasp. It’s a huge, heavy cab which is why the bail is so wide. I made some simple earrings in the necklace colors. I want the focus to be on the necklace, ot the earrings. The beads are from SeedBeadSue, a.k.a. MiyukiGalBeads on ebay. She had the perfect colors to go with the stone. Choosing the colors was a project in itself. I wanted to bring out and accent the stone colors. I used olive green, silver lined Capri blue, silver lined aqua and lt. topaz. The cab came from Overstock.com believe it or not. This pic shows the color of the stone the best. It really has a lot of blue flash to it. The completed set. This is mine. LOL! I love the way it feels and I fell in love with that cab the second I laid eyes on it. I just wanted to say that I am still alive and still beading ornament drapes. The good news is that I am halfway finished. WOOHOOO!!!!! In the midst of all this beading, I have managed to create my own pattern and have stumbled across some cool color combos. I’m still hanging out at SJA, while I’m beading. I’ll be back to blog more when I get this order done. Only 63 more to go!! I had lots of trial and error while I was designing and looming this choker. At one point, it looked like whale flukes. LOL! If you would like to read about the trials and tribulations that were endured while this was a work in progess, it can be seen http://www.starvingjewelryartists.com/index.php?showtopic=7108 here on the forum. Complete with pics of what it looked like a few times. I am so bad about keeping this blog updated. Here is what I have been doing the past couple of weeks-or longer. LOL! I have had an idea for a lightening bolt loomed choker in my head for a while, now. I finally got it sketched out and beaded. I used DynaMite OP black, and Trans. Rainbow Purple for the main collar. I used a ton of different beads for the fringe-Ornela twisted bugles in rainbow purple and iris peacock, 4mm FP watermelon and purple iris, Ming Tree bugles in rainbow peacock, DynaMite SL purple bugles,and an assortment of beads with a rainbow/iris finish that I got from yard sale jewelry. 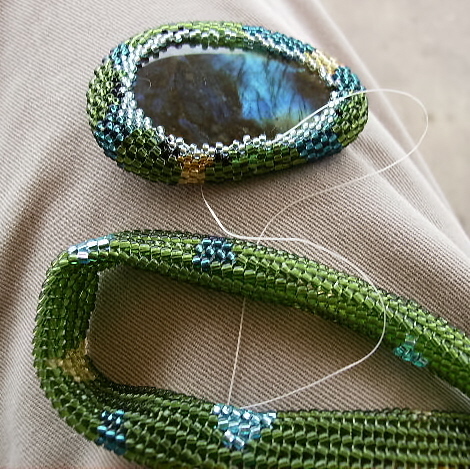 It has a peyote toggle clasp/loop closure. It was fun looming this piece. It’s been too long since I have loomed anything. I’m now trying to come up with some earrings that will go with it and not be overpowered by the fringe on the choker. I still can’t get the hang of the new ways to post pics here, so sorry for the double close up of the fringe pics. When I photographed the finished piece, I realized that the irridescent colors of the beads weren’t showing well, so I added that pic. 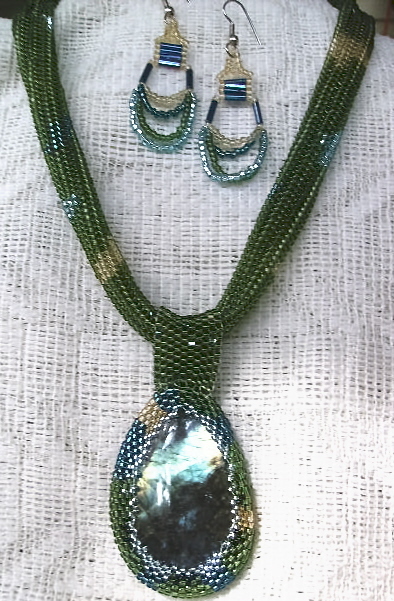 The irredescence of the beads is a major part of the choker. I love making ornament drapes-especially the ones that other people have designed and have put those patterns out there for sale or for free. I’m hardheaded, so I am attempting to design my own. I have made some small components with seed beads (what else) and for the last 2 weeks have been trying to combine them in a netting effect over a shatterproof ornament. I have taken it apart 5 or 6 times while I was working on it, thinking I had a better way to do it. I use some of the cheap beading thread from Walmart for my “experiments”. That way I don’t feel bad about wasting thread when I cut something up. LOL! I also had to remake some of the componenets because in cutting them apart from each other, I managed to cut the thread in a couple of them. That’s ok. Gave me more time to think about how to put them together. I think I may be close to finishing a prototype. I have it over the ornament now and it’s close to being closed up. It would be a good time to have an octopus for a pet because trying to hold slippery seed beads over an equally slippery ornament requires a lot of firm holding onto both while trying to get a needle through a nearly full seed bead with one hand. I tried painters tape and that gave me enough help so I could baste a few together so I could see what needed to be attached where. I see bugs and kinks in it now that I have decided not to correct at this point in time. I will work around them just to get it finished and see if the idea in my head looks remotely like what is in my hand. I will deal with the kinks if I decide to do another one. That is still undecided. It’s been an interesting, not to mention a time consuming experience. It has shown me that I have more patience than I gave myself credit for. LOL! Jewelry Making Suppl… on Got a dog!!!!!!! !